Crikey! Say “G’day” to Me New Mayte! OK, I wanted to be clever. Sorry. That’s not going to happen. Nope. Not today. I wanted to write something that would make you wonder. That would keep you at the edge of your seat. That would make you laugh with joy along with me. Instead, I’m just going to introduce you to me new mayte. 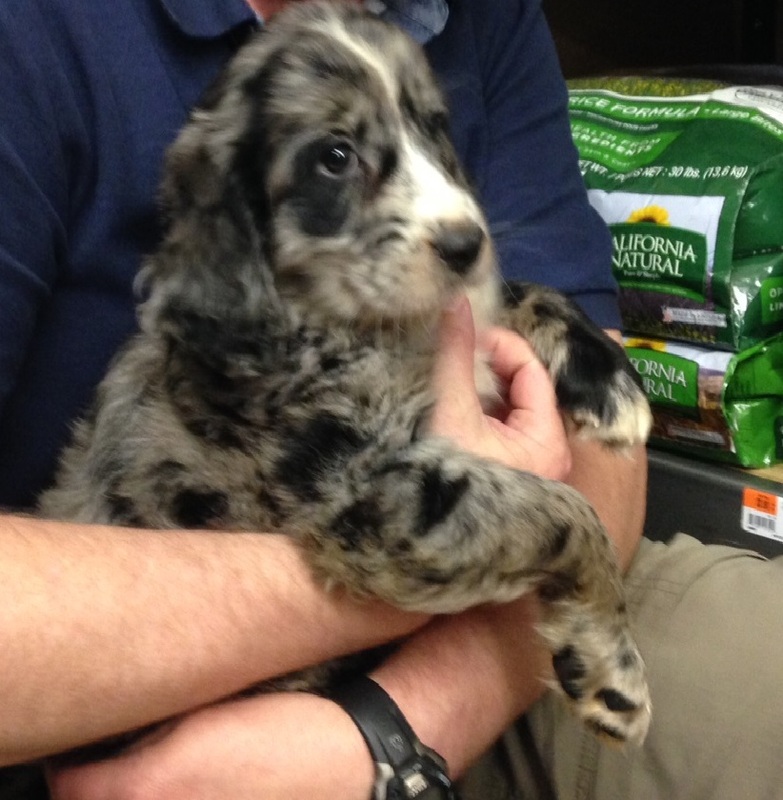 Duncan is a rescue puppy — a mixed Springer Spaniel/Australian shepherd. He came to us through a program that finds homes for the pets (and their pets’ progeny) of deployed service men and women. John’s sister found him on-line, sent me a link to him on petfinders.com, our application flew in and it was approved right away. All of this happened on Monday. Since then, we’ve been in a flurry of activity getting ready for a puppy. I’m absolutely possible he will be an angel. Always. I will probably be a bit scarce around these parts for a while! Duncan is adorable. I hope it is all working out for the two of you. In my next post, you’ll learn that he almost immediately got very sick and had to be hospitalized. He survived whatever it was he had and is now an angel/demon puppy. Just as he should be! He is like having a baby penguin with razor teeth! Hooray for Duncan’s arrival … and I know you will work hard at making him ship-shape for the future. Cheers to Duncan for landing with responsible and caring owners! Well, phooey … did I ever pick the wrong day to be late to the party! I saw that you already know about his mis-adventure so I am looking forward to fun stories! Oh, Duncan looks adorable! When do you get him? I’m so happy for you! We go him on Saturday, and had one misadventure already. See the next post. But Duncan is fine now. Thanks, Trend! He’s a bit of alright! I know I’m saying the same thing a lot of people are saying, but OMG, so cute!!!!! Thanks, Roxie. I know you know Chapter 2. Chapter 3 seems to be happier! Welcome, Duncan! He is absolutely irresistible! Thanks, Cindi. He really is! Thanks, Re eye. He is — and quite a handful! Duncan is a good name. He looks like a Duncan. Duncan was the King of Scotland in Shakespeare’s Macbeth. He represented moral order. That’s why we chose the name. The dog who would be king! He is lovely! I am so happy you have a new friend to love and play with. Isn’t he a cutie? Tonight was the first day going to work and when I arrived home it was to puppy kisses and tail wags. I missed that the most! Welcome Duncan! He doesn’t even know how much love he is in store for in your hands. I’m so happy for you and your family and especially for Duncan who is about to get the ride of his life!!!! He is just precious! He is so freaking CUTE!! Enjoy him Elyse! I’m thinking of getting a puppy next year, it’s been way too long since I had a dog. Isn’t he? I saw his picture and sent a long email to the woman who’d listed him immediately. John was in shell-shock for the first 24-hours after we were approved. Then he said, well, we adopted a KID without meeting him first! Then the color returned to his face, the air into his lungs. Let me get this straight, Darla: you’ve waited until you were going to be working to get a dog?!? Well….my mom lives with me so maybe she could take him for walks and keep him from chewing through all the couch cushions and power cords right? Aw, he’s beautiful! Congratulations! And you can always write us little updates on his antics! Have fun! Thanks, Moms. I’m sure his angelic behavior will grace this blog from time to time! That is an adorable dog… you do know that Australian shepherds are famous for two things… the never run out of energy, because they are a working breed, and they need lots of exercise and room to run around… and they are smart, because they worked for a living, so they need lot of interaction and things to keep them busy. Oh yeah, you got your work cut out for you… HA! Yes, I know my dogs, so to the extent I can know what I’m getting into, I do. But memory is so very selective! John, Jacob and I have already asked each other “Did Cooper do that?” A million times. And I’m sure you’re right about the intelligence, too. I’m a big fan of smart dogs. I’ve had two German shepherds and a Bernese Mountain Dog, so I know smart. Smart fogs usually have a great sense of humor! wait… John Jacob Jinglehiemer Schmidt??? And Bernese mountain dogs are my favorite dogs ever… met one in Switzerland… in fact I met one just the other day. He is adorable — especially now when he is sleeping and not trying to eat the couch. Aaaaaaawwww! He is just gawjuss! I’m certain he’ll keep you on your toes, he looks like he’s got lots of energy to burn off by having fun with his new mum and dad. Isn’t he? He is a sweet guy. And energy? Oh yeah — and it’s not mine! Isn’t he a cutie? He is incredibly soft too. More like down than fur. And I’m sure there will be no misadventures to write about. None at all. Nope. Oh so cute! Enjoy the time bonding with your newest family member. Thanks, Deborah. So far, so good. I’m sure he will be quite a rascal, but he is adorable! He really is. He looks like he’s wearing camouflage! He looks lovely! As a past owner of three rescue dogs, I am sure he will be wonderful once he calms down from all the changes in his little world. Mine were all nervous at first but after 48 hours or so, that wore off, lol. Well, we’ve only known him for 7-1/2 hours , but so far he seems like a very confident little guy. Not at all crazy like my rescue shepherd was — or yours! How cute he is! Good luck. It’s kind of like bringing home a new baby, isn’t it? Aw, so cute! What a dear face! He is a little sweetie. I am sure he will never misbehave. Ever. Positive. Thanks, Sabra, I am. Although I was on the night shift last night so I am enjoying him through half shut eyes! Thanks, Sunshine. We are delighted. And I am pretty sure that is NOT just because he hasn’t yet pee’d on the floor! I’m a true dog person — I have been aching for one since we lost Cooper last August. My husband needed to mourn, though. Duncan is now curled up on John’s feet. It’s been a good day for all of us! Well, then. It looks like he has made a choice. Sorry about Cooper. That is a sad thing when we lose our babies. Been there too, unfortunately. Enjoy your new Duncan! Awwww, he is adorable. Congrats on your new family member Elyse.I doubt he’ll slow down your writing – in fact his shenanigans may very well give more blog material. He probably will, but not quite yet. But my best stories, in my opinion, are my dog stories. I’ve been dogless for 10 months and it was KILLING me. Not any more! What a sweetheart! I’m looking forward to further episodes. Can you imagine the talent of the mixed breed? I grew up with mutts, and Goliath my first dog as an adult was a mix when we had a small child, my husband wanted a purebred, thinking he’d know what he was getting. (Yes and no). But our so is grown and so it’s back to mutts for me!. He is. And he promised to never misbehave. DUNCAN. Look at that FACE. I’m so happy for you, my friend. Please send Auntie Eva photos. I WANT TO HUG THAT FACE. Thanks. He is your vicarious puppy! Yes he is. Hopefully, he’ll have a puppy pen pal soon. Well, with the experience of 6 hours, I highly recommend Petfinders.com. More likely now through “FoundPet.com”!